The Czech Martin Kolomy of the Tatra Buggyra Team was deprived of his first stage victory by two defects in the second part of Thursday´s speed test. Martin Soltys with the second Tatra Phoenix also lived through a drama on the track and only reached the bivouac early in the morning. But he is capable of continuing in the race nevertheless. After the demanding stage the whole team had the hardest night of the whole Dakar. "Martin Soltys also felt the extremes of this edition when he had to struggle with technical issues," said Team Manager Jan Kalivoda. "Luckily they managed to repair them and now they are on the way to the bivouac. It looked as a stage victory for a while for Martin Kolomy by then he also had some technical problems. They had two defects which held them down a little. 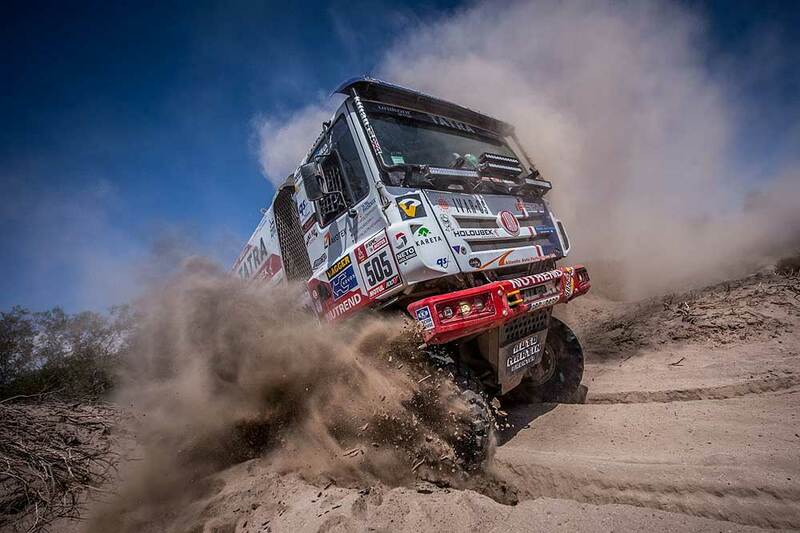 But he is in the bivouac and the truck will be put together again,“ said the team managed Jan Kalivoda at two in the morning local time. "This year Dakar really demonstrates that is it an extreme competition. Looking around the bivouac all have problems and I think we are among those with the lowest number of issues to address. Unfortunately, we are not completely without technical problems," described Kalivoda difficult moments of tonight. "Although I has a technical trouble yesterday my Tatra did not betray me and pulled me to the finish with just its front axle working, so I am happy I can continue and I hope we will all meet in the finish," said Kolomy before the start of the 12th stage. Two defects then deprived him of his first stage victory this year. "We really flew through the first part of SS12, and even managed to win it. However, in the second part we had to change a tire twice and that means some loss for us. Pity, we were close to the podium," described Kolomy the Wednesday stage. Martin Soltys experienced several dramas on the road and only reached the bivouac on early morning of the following day. "It was difficult again, our intercom broke down right after start so we had to shout on each other all day. Then we buried ourselves n a dune where we acquired some loss and towards the end of part one we had some problems with the clutch. So we took a little more time on the road and only arrived at the bivouac at fine in the morning. In a couple of moments we are off for the next stage again," said the tired Martin Soltys in the bivouac in the morning. In the words of Jan Kalivoda, tonight was the worst night of all at this edition of the Dakar Rally. "It is six in the morning and luckily we have both trucks out of the bivouac and on the road again. Tonight was a real extreme. Check of Martin Kolomy´s truck found some problems with the rear axle, so we decided to change it, to be on the safe side. Only we did not have any spare one anymore for we have already changed it twice in succession," was the description of the current situation by the team manager. "Luckily the boys of the Adria Team offered their, thus sacrificing their dream for Martin Kolomy to be able to continue. So we took their rear axle and put it on Martin´s truck. My great thanks to them, such self-sacrifice is rare indeed." 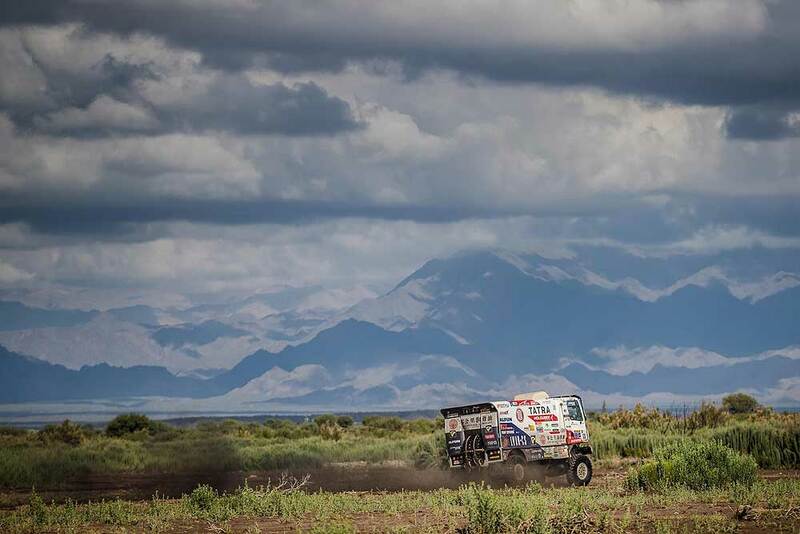 The Adria Team with the third Tatra of Buggyra chose the worst date for their Dakar premiere. The organizers heard complaints of some pilots about the demand of the competition and prepared an extreme race after several years again. They considered giving up the race for its extreme demand after SS10 anyway. When the unpredictable situation occurred in the night, they did not hesitate and sacrificed themselves for Martin Kolomy. "I think to get as far as here is our great success anyway, considering the number of trucks that have already given up before today. When they approached us with the plea to provide our axle we did not hesitate at all," explained Petr Lesák, the navigator of the Adria team, thus giving up his dream mere three stages before the finish.